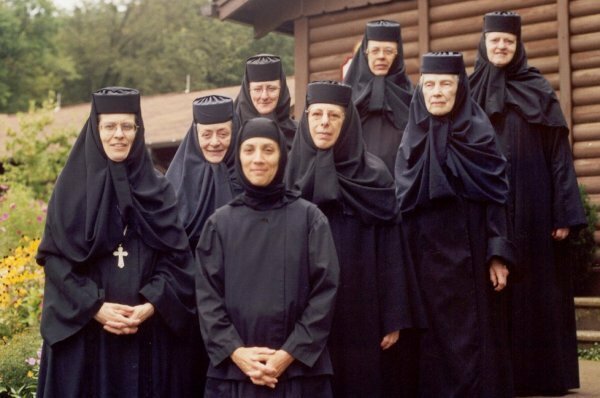 On Saturday, October 13, 2012, the sisterhood and friends of the Orthodox Monastery of the Transfiguration here celebrated the 25th anniversary of the elevation of the Very Reverend Mother Christophora to abbess of the monastery. The day opened with the celebration of the Divine Liturgy in the monastery chapel, at which Archbishop Nathaniel of Detroit and the Romanian Episcopate presided. Also serving were Bishop Melchisedek of Pittsburgh and Western Pennsylvania, Archimandrite Pitirim (Stehnach), and Protopresbyter Thomas Hopko. Attending monastics included Archimandrite Alexander, abbot of the Orthodox Monastery of Saint John the Theologian, Hiram, OH; abbesses Mother Theonymphy of Saint Mary of Egypt Orthodox Monastery, Cleveland, OH and Mother Alexandra of Saint Thekla Orthodox Monastery, Bolivar, PA; and Sister Mary Virginia, superior of the Byzantine Carmelite Monastery, Aliquippa, PA.
A Service of Thanksgiving followed, after which Archbishop Nathaniel presented Mother Christophora with a jeweled cross which he had made. Also present for the Service of Thanksgiving was Metropolitan Theodosius, who presented her with a large beautiful icon of the Mother of God painted in Romania—a gift to him from the Patriarch. A luncheon was held at a nearby restaurant, attended by the two hierarchs, area clergy, members of Mother Christophora’s family, friends, neighbors, and monastery workers. The toast was offered by Archimandrite Alexander. Archpriest Andrew Matychak, Mother Christophora’s brother, also spoke at the luncheon. Her sisterhood also thanked her for her gently firm leadership, and for teaching us by the example of her godly life which is thoroughly immersed in the ancient monastic tradition. The sisters presented Mother with a hand-painted icon of the Protection of the Mother of God, to whom our future small prayer chapel will be dedicated. In honor of this anniversary, they also set the Paraklesis Service to a Ukrainian/Polish tone and presented her with the first CD of this. Live music was played and sung by sisters and friends during the luncheon and as a part of the program afterwards.